Long life empowerment at Gyang Guthi Monastery by His Holiness Shakya Trizin. Boudha, Kathmandu, Nepal. 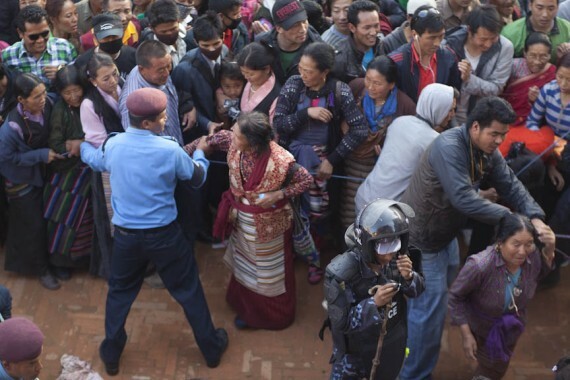 Tibetans in Nepal are caught in a crisis that is getting worse, fast. In 2012 conflict inside Tibet has accelerated and the crackdown on Tibetans in Nepal has intensified. To date, at least 33 people have immolated themselves in public in Tibet whilst shouting for the return of the Dalai Lama. The Chinese military has predictably met all protests with brute force, imposing de facto martial law across all Tibetan regions within the People’s Republic of China. China is exerting effective pressure on the new government of Baburam Bhattarai to control “anti-Chinese separatist forces in Nepal” to quote Xinhua, the official news service of the PRC. China is now claiming suzerainty over all Tibetan Buddhist ethnic and cultural zones, which span the Himalayan Belt of Nepal, Sikkim, Bhutan, Ladakh and Arunachal Pradesh in India, as it advances its hegemonic ambitions in South and Southeast Asia with a bellicosity that could hardly be categorized as “soft power.” Chinese engineers are advancing into Nepal from Tibet, building roads and monopolizing trade with a strategic advantage that no amount of western aid or international press coverage can possibly counter. Chinese security forces are well established all along the Tibet-Nepal border. Since the 2008 Lhasa Uprising, the Chinese military has sealed off most of the mountain passes linking Tibet and Nepal, which has drastically reduced the number of new escapees. Tibetans are at great risk of capture and refoulement at the Nepal-Tibet border with no international monitoring or protection and negligible media coverage. Tibetans in Kathmandu, once a safe haven for refugees and still a nexus of Tibetan culture, religion and commerce, endure constant harassment, random search and arrest by both Nepali police and Chinese agents. Any expressions of concern for the people inside Tibet are swiftly halted and the organizers punished. In 1959, Nepal’s King Mahendra defied Chairman Mao and granted protection to refugees from Tibet. The oldest settlements in Nepal, Jawalakhel and Jorpati, were given to the Tibetans as a royal gift from the palace in 1960. Pokhara, set in a valley below the Annapurna massif, is home to four Tibetan refugee camps. The Swiss Red Cross built Tashi Peykhil in 1962 and Tashiling in 1965. The Chushi Gangdruk created the Paljorling and Jampaling Camps in 1972. There are still many small Tibetan refugee settlements along the border regions from Solokhumbu to Rewalsar. King Birendra continued his father’s policy of generous refuge for Tibetans when a second exodus began in the 1980’s. Since the March 2008 uprising in Tibet, the refugee passage has dropped from about 6,000 to 8,000 escapees a year to less than 700. UNHCR continues to operate a Reception Center in Kathmandu, which provides temporary shelter, food and medical care and coordinates with the Indian embassy to process visas for the new refugees. But Nepal is not a signatory to international refugee conventions, thus there is no protection from refoulement, and no support for refugees who have lived in Nepal for 53 years. About 13,000 Tibetan are registered as refugees with the Nepali government, but a large number of Tibetans are undocumented, thus unofficial surveys suggest that the number of Tibetans in Nepal is at more than 25,000. For decades, Tibetans operated hotels, boutiques and restaurants, and were Nepal’s first industrialists, building carpet factories that employed tens of thousands of Nepali workers and brought wealth to the Kathmandu Valley. Exiled Tibetan lamas built monasteries across Nepal, which draw pilgrims and students from across the globe and young Buddhist monks from Nepal’s northern regions. The “Tibet Brand” brings tens of thousands of pilgrims and tourists to Nepal every year. Nepalis can sell Tibetan flags, tee shirts and posters, but Tibetan businessmen are threatened with extortion for hanging a photograph of HH Dalai Lama in an office or hotel lobby. After the assassination of King Birendra in 2001, the Tibetans refugees lost the protection of the palace. This complex, multi-generational refugee community still living in the old settlements is poor, marginalized, isolated, with no legal protection and no leadership. Tibetans in Nepal have few allies to counter China’s aggressive intrusions into Nepal’s oversight of the Tibetan refugee populace. In February 2012, 18 Tibetan high school students staged a small protest before the United Nations headquarters in Kathmandu and were arrested and imprisoned for nearly 2 weeks. In April 2012 the BBC filmed another violent arrest of Tibetans in front of the UN offices in Kathmandu. One group scaled the walls of the UN compound and met with a UN representative, but neither the UN nor any diplomatic mission in Kathmandu has the authority to reverse Nepal’s harsh new policy towards Tibetans. The Dalai Lama’s Central Tibetan Administration based in Dharamshala, India operated a legally registered Tibetan welfare office in Nepal from 1961 until 2006. The office still functions, but in a highly reduced capacity. Policies implemented by former Kalon Tripa Samdhong Rinpoche contributed to the fragmentation of the Tibetan refugee networks in Nepal, with the sale of CTA owned businesses and the termination of CTA security officials at the Reception Center and Kathmandu office. 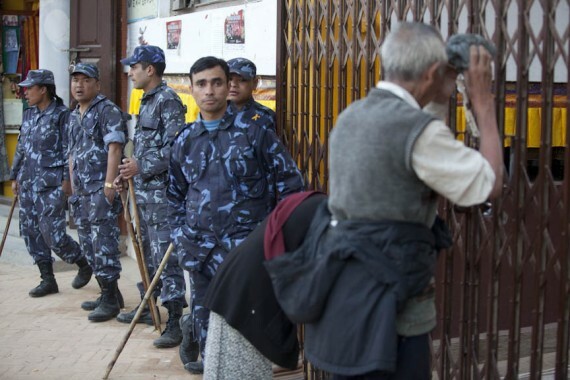 Tibetan exile government officials from India are now fearful of travelling to Nepal. The Dalai Lama has only been to Nepal once; in 1981 he made a six-hour visit to Lumbini, birthplace of the Buddha. In October 2011, US State department officials visited the old Jawalakhel camp and were followed by 12 armed policemen at every step, and a representative of the Dalai Lama’s office was arrested, without charges or warrant. He was later released after interventions from UNHCR and the US Embassy, but random raids from Nepali security forces have become routine, inciting fear and anxiety further isolating Tibetans refugees from allies and witnesses. Since the 1990’s, when the Maoist insurgency began, Nepal’s Maoists have targeted Tibetan businesses with extortion and assault, forcing many to close, depriving hundreds of thousands of Nepal workers of employment, mostly in the Tibetan carpet industry, which for decades was Nepal’s largest source of capital and international trade. Officials from the US Embassy, UNHCR, the Indian Embassy and Nepali government all concur that Chinese pressure, through military exchanges, aid donations and bribery, has been highly successful in isolating and weakening the Tibetan community in Nepal. Yang Houlan, the current Chinese ambassador to Nepal, has issued several press releases stating that Nepal must be “cleansed of anti-Chinese elements”. His embassy is exerting extreme pressure upon Nepal’s fragile government to deny Tibetans any kind of legal residency status, to restrict all Tibetan economic and cultural activities, to the prevent Tibetan escapees from crossing the Nepal border. The Tibetan community in Nepal is now thoroughly infiltrated with Chinese agents and spies. China maintains a highly effective espionage network of human and cyber intelligence gathering, employing Indians, Nepalis and even westerners, to collect information on Tibetans activities in exile. A large number of these agents are Tibetans from Chinese Occupied Tibet who have been trained in military academies in China and travel on Chinese passports. Tibetans in Nepal describe being approached by such agents who offer enormous bribes in exchange for abandoning “The Dalai” and “joining us”. If the bribe is refused, agents become hostile, threaten retribution and in some cases attempt kidnapping. On Jan. 14th 2012, Chinese Premiere Wen Jiabao, made a 6-hour visit to Kathmandu. In official meetings he asked for specific details on the number and status of Tibetans in Nepal and made clear that the Tibetan community is to be repressed as a condition for Chinese investment and aid. After Wen’s visit, surveillance, harassment and intimidation of Tibetans in Nepal has visibly increased, also targeting Nepali citizens who practice Tibetan Buddhism and resemble Tibetans in dress and custom, Sherpas, Tamangs, Manangs, inciting confusion and conflict in Nepal’s Buddhist communities. There is a visible spike in anti-Tibetan media coverage in the media. Kantipur, Nepal’s largest selling Nepali language newspaper, regularly prints anti-Tibetan editorials and diatribes. The Kathmandu Post, The Himalayan and Republica, the three leading English language papers, report on Tibetan events with a strong anti-Tibetan bias, frequently casting Tibetan protestors – who are small in number and never violent – as threats to national security and obstacles to China-Nepal relations. This negative reporting incites suspicion and paranoia about Tibetans in Nepal, which the fractured refugee community does not have the means to contest or alleviate. Some Nepali writers have criticized the excessive use of force by police officers at Tibetan gatherings and express concerns that China’s assault on their Tibetan neighbors is a threat to Nepal’s sovereignty, but these opinion pieces are very small in number. On March 10th, the 53rd anniversary of the Lhasa Uprising was observed throughout the Tibetan exile community in India and Nepal. Prior to the murder of King Birendra in 2001, Tibetans would gather at the great Stupa of Boudhanath, where a member of Nepal’s Royal family would stand beside the Dalai Lama’s representative and read aloud a statement of support in Nepali. In the late 1990’s the police presence started to grow and the event frequently ended with minor scuffles, but in the last 10 years the Nepali security presence has grown so large and so lethal it far outnumbers the number of Tibetans who gather for the vigil. Many are beaten and arrested at once, and are thereafter on “watch lists” and subject to constant surveillance and harassment. On March 10th 2012, a small gathering of Tibetans convened at Sherap Ling Monastery in Boudha. A large contingent of Nepal police stood guard outside the monastery while undercover agents moved conspicuously through the vigil. When the ceremony concluded the Tibetans fled to their homes, chased by police who entered homes and monasteries in an extremely aggressive and hostile manner, chasing monks and students with lathi sticks, threatening journalists or western observers who questioned the unwarranted use of force. A senior Nepali official of the Home Ministry stated “China’s number once interest in Nepal is the Tibetan refugees: they have detailed files on all the Tibetans in Nepal.” Chinese officials insist that Dalai Lama, whom they refer to as ‘The Separatist’, has a large, well-financed network of agents operating in Nepal and Tibet who are a “threat to national security.” Anyone who has visited the Dalai Lama’s exile home in Dharamshala knows that the Tibetan refugee community is small, fragile and poor, but this propaganda is aggressively pushed by Chinese officials along with financial inducements to regard Tibetan refugees as hostile and dangerous elements. In 1998, the Nepali government stopped issuing Refugee Cards (RCs) to Tibetans born in Nepal after 1989. This third young generation of Tibetans in Nepal are today undocumented persons, they cannot obtain any valid identification papers, residency permits or travel documents, even official Nepali birth certificates are now deemed invalid. It is the poorest Tibetans living in the old, decaying camp system who are most emotionally affected by the crisis in Tibet, and most likely to participate in political demonstrations, which now incurs great risks. On Nov 2nd 2011 Sonam Choedon, a Tibetan woman in Jawalakhel, doused herself in kerosene and attempted self immolation. She was restrained by police and taken to a clinic for burn injuries. On Nov 3rd, Sherab Tsedor, a 25-year-old Tibetan refugee living in India, set himself on fire, in front of the Chinese Embassy in the Indian capital of New Delhi. The Tibetan refugee passage is the longest and most dangerous escape route on earth: travelling on foot cross the Himalayas. Refugees who survived the ascent from Mount Everest and eluded Chinese patrols at the Nepal border were formerly rescued by UN protection officers, but for years UNHCR has not been granted permission to operate at the border. With the loss of international monitoring at the border, documenting cases of refoulement is extremely difficult. A young refugee named Tashi entered Nepal in mid-September 2011 with a group of five other Tibetans from his village of around the same age. The six young men each paid a guide 6000 yuan (approximately US $943) to travel from Lhasa to the Nepal border. When the group reached Nepal in mid-September, Tashi was separated from the group and the International Campaign for Tibet verified his refoulement three months after it occurred. A group of 23 Tibetans in the border area was also detained at the same time, many of them children under the age of 10. They were taken into custody of Nepal’s Department of Immigration in Kathmandu for 12 days before being handed over to the UNHCR, despite pressure from the Chinese embassy to remand the refugees to border police. Two U.S. Congressmen, Steve Chabot and James Sensenbrenner, visited Kathmandu in late September and October and publicly stated the US support for the Tibetan refugees. On Nov. 4th, Rep. Frank Wolf (R-VA) of the US House Appropriations Committee said he would try to block funding to Nepal unless it grants exit visas to Tibetans who seek refuge in the United States. (In 2010 USAID contributed $56 million in funds in Nepal). On November 20, U.S. Ambassador Scott DeLisi’s article in the Kathmandu Post was published when Nepal’s Foreign Minister Narayan Kaji Shrestha visited Lhasa, Tibet, where he pledged to not allow any “anti-Chinese activities” on Nepali soil. Today about 3,000 Tibetan refugees in the Pokhara camps. The camp schools are clinics are funded by the Snow Lion Foundation and European NGO’s, but are cut off from the CTA based in Dharamshala. Pokhara, once the exile headquarters of the Chushi Gandruk, is now a Chinese City. There used to be 150 Tibetan shops in the lakeside tourist district, but now there are only 12 left. Chinese businesses dominate the landscape; everywhere, hotels, restaurants, stores for Chinese tourists. In 2011, for the first time, Nepali soldiers, armed with guns and batons, stopped all celebrations of the Dalai Lama’s birthday in Pokhara. (The Dalai Lama’s birthday observances have been banned in Kathmandu since the 2008 Lhasa Uprising). Tibetans have been stateless exiles for 53 years; second to the Palestinians as the world’s longest unresolved refugee crisis. The Dalai Lama is one of the world’s most respected individuals, the Tibetan cause generates sympathy, but it does not translate into material support for tens of thousands of refugees scattered across the Indian subcontinent in a fragile diaspora. The options for the Tibetan refugees in Nepal are constrained when the state of governance is fragile after a lengthy and destructive civil war wherein 15,000 citizens were killed, thousands more tortured, traumatized, driven from their homes. Nepal enters the 21st century an impoverished state of 28 million people, struggling to form a republic from an absolute monarchy. Kathmandu is choked by a toxic merger of pollution, overpopulation, chronic shortages of water, electricity and petrol. In 2011 the Maoist government expelled two UN agencies, UNMIN and OHCHR, before they had completed their mission to investigate wartime atrocities and bring perpetrators to justice. The new constitution has yet to be drafted and ratified, thus the status of Tibetan and other refugees in Nepal remains unresolved and is likely to remain so for the foreseeable future. Nepal, anchor of the Himalayan Belt, abode of Shiva and Buddha, the lone buffer state affixed between China and India, lurches towards an uncertain future, the age of kings eclipsed by the Communist Manifesto. In the 15 years of the insurgency, the Maoists did not bring food, schoolbooks or medicine to the rural poor. They brought combat fatigues, rifles and grenades, the torture techniques of the Khmer Rouge and the revolutionary hysteria of the Red Guards. The Maoists now rule Kathmandu, giving the People’s Republic of China a foothold in South Asia. In the Cold War period China was a feared and distant presence in the Himalayan Belt. India was, and still is, Nepal’s largest foreign aid donor and sole source of petrol and other essential commodities. A Treaty of Peace and Friendship, hastily enacted after India’s defeat in the 1962 war – allows Indian and Nepalese citizens to travel to each other’s countries without a passport or visa. Over 8 million Nepalis lives and work in India, yet in 2008 the Nepali Maoists have moved to revoke the terms of the treaty with India, while encouraging stronger ties with China. China was never a dominant presence in Nepal before the Jana Andolan movement in the early 1990’s. Now China’s influence in Nepal is ubiquitous; Chinese engineers are now expanding the “Friendship Highway” and developing projects along the Tibet-Nepal border. Kathmandu is filled with new organizations promoting “China-Nepal Friendship”, with trade fairs, academic conferences, cultural shows and tourism. Integration of Tibetan refugees in Nepal is increasingly untenable with the ascendancy of the Maoists and their close ties to Beijing. Resettlement would alleviate pressure on the Nepali government and rescue Tibetan refugees from danger. In 2006-7, the US government proposed re-settlement of up to 5,000 Tibetan refugees from Nepal, but the Maoist government refuses to issue exit permits for Tibetans. In 2011 three US congressmen sent a letter to the Prime Minister Bhattarai on the status of the Tibetan refugees, which was duly noted. By raising the matter, the US government could open a new dialogue with Nepali officials about Tibetan residency papers, protection and re-settlement, which is in Nepal’s interest. The US has just re-settled 80,000 Bhutanese refugees from Nepal; can the US use this as leverage to re-settle a much smaller number of Tibetans refugees? Thank you for a very comprehensive and complete picture of the plight of Tibetans in Nepal. Unfortunately, Nepal has fallen into the hands of the communist lapdogs and as of right now it is looking quite bleak. India might be eventually forced to make its stand while China slowly encircles it with hostile forces. Hopefully, it will be sooner than later.